The Light Streams are Jack Simpson (guitar and vocals), Ryan Mulhern (bass and vocals), and Jimmy Milne (drums and vocals). They are coming to Jersey from Leeds, home of Leeds United and the Henry Moore Institute, as well as many other great things. Until recently they were known as Rivers. The songs of Rivers reveal a stunning depth of feeling and joyful approach to melodic invention. Their work with Leeds-based label SoundPeople is noted for its quality and credibility. A change of name for a new year, and The Light Streams continue to forge a unique path through the British pop landscape. New songs from the EP see them exploring even more thoroughly the authenticity and soulfulness of timeless pop and rock forms. Their new release, The Lost EP, will be released in June. It was recorded with Andy Hawkins, notable Leeds-based musician and producer of the Pigeon Detectives, Matchbook Romance, and Kaiser Chiefs, among many others. The Light Streams are a three-piece rock band whose sound is informed by many musical influences, with the classic pop of Beatles and The Byrds well to the fore and mixed ingeniously with sonic experimentalism. A lean, efficient musical prospect on stage as well as in the studio, their songs from Lost EP demonstrate a mastery of the art of the intelligent pop song – groovy, arty (but not arch), and richly orchestrated. They’ve recently played a handful of well-received shows, and have a few small festivals booked and some dates in Europe planned for later this year. 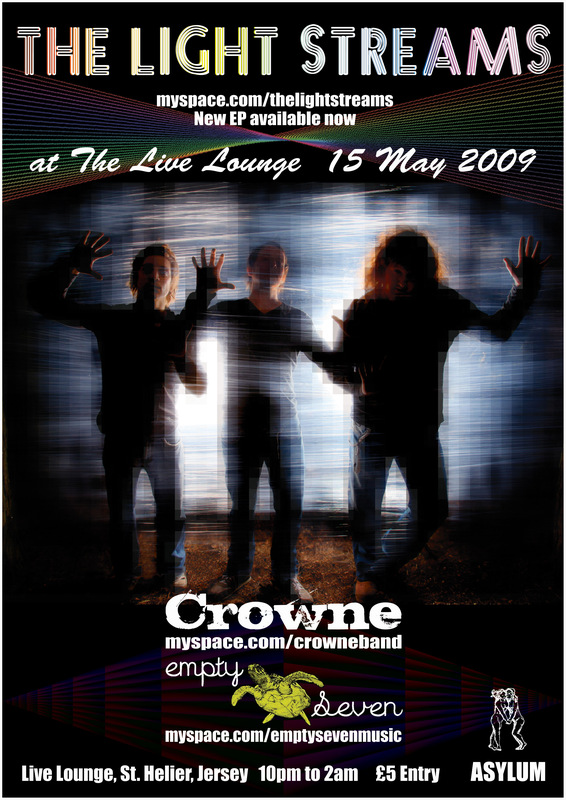 Crowne are Rory Thun (guitar and vocals), Marcin Lach (drums), Mirek Lenart (bass), and James Underwood (guitar and vocals). Crowne have been finding artistic inspiration from Germany, Poland and just about everywhere in Europe. They say you could describe their music as being commercial radio music, and the recordings they have produced to date certainly have the sheen and impact one would expect to find in the kinds of anthemic showstoppers that routinely ride high in the European charts. They prefer to think of what they do as four guys showing life as they see it through music. The Empty Seven are Shane (guitar), Kerry (vocals), Dan (bass and vocals), Stewart (drums), Rhodri (guitar), and Elmo (turtle). This year they have played at Club 72, Terminology and Asylum, and in all cases audiences have been impressed by the kinetic muscularity of the grooves, the wonderful hook-rich nature of the band’s arrangements, and the beautiful voice of vocalist Kerry.